Low calorie alcohol may help you keep your diet on track this holiday season. The term "low calorie alcohol" is somewhat of a misnomer, since all alcohol has the same amount of calories. Pure alcohol has seven calories per gram. This makes alcohol more calorically dense than carbohydrates and proteins, which each have four calories per gram, but less calorically dense than fats, which have nine calories per gram. The other consideration when incorporating alcohol into your diet is how alcohol is handled by the body. In the presence of other nutrients, alcohol is always metabolized first. This means that if you are on any type of a diet, your body will not burn anything - not body fat, not carbohydrates, not glycogen nor any nutrients from the foods you eat - until the alcohol has been fully metabolized. This is of special importance to low carbohydrate dieters. As you have seen, all alcohol has the same calories per gram; however, in most drinks, alcohol isn't the only thing present. Different liquors are made from a variety of different things and have different concentrations of pure alcohol. Therefore, while alcohol itself always has seven calories per gram, different alcoholic beverages have differing calorie counts based on how concentrated the alcohol level is, what the liquor is made from and what types of mixers are used to make each drink. There are two big dangers involved with drinking alcohol and dieting. The first is that the calories, even in a low calorie drink, do add up. If you have more than one or two drinks, you'll be adding calories where you don't need them. The other problem arises from the lowered inhibitions that come as part and parcel of consuming alcoholic beverages. Many dieters find it is far easy to go off track and eat high calorie foods with a drink or two under their belts. The solution to both of these problems is moderation. If you occasionally drink in moderation, you are less likely to see your diet derailed. In the case of most alcoholic beverages, calorie counts soar as sugary mixers and/or heavy creams are added in. It is possible, however, to enjoy a low calorie alcoholic beverage as part of your reduced-calorie diet. One way to do this is to mix liquors such as gin, vodka and whiskey with water or soda water. Drinking them neat or on the rocks will also help to control caloric intake. Below are some of your best bets for mixed drinks without the calories. This classic drink is made with gin, tonic water and ice. Since gin has about 65 calories per ounce and tonic water has only ten calories per ounce, a gin and tonic is a good bet to keep your calories low while you are imbibing. You can even add a twist of lime for a negligible amount of calories. Rum and coke is a popular drink, but sugary colas contain lots of calories. By making the simple swap from regular cola to diet cola and adding a single shot of rum to the drink, you can save over 100 calories. This spicy, classic cocktail is made from tomato juice, lemon, Worcestershire sauce, Tobasco and vodka. 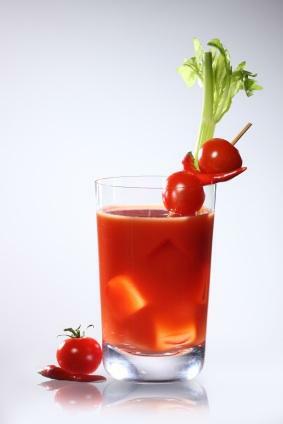 A ten ounce bloody mary has 125 calories, even with celery tossed in as a garnish. This beverage is often overlooked, because light beers have long been eschewed as watered down, flavorless versions of the original. Light beer has come a long way, however. Today, many manufacturers make delicious light beers that weigh in at around 70 calories. Some terrific light beers to try include Beck's Light, Michelob Ultra Amber, Amstel Light and Sam Adams Light. Wine spritzers have been around for a long time. Made by combining white wine and club soda, drinkers still get the flavor of the wine with fewer calories. Dry white wines have 120 calories per five ounce serving while club soda has zero calories. Tossing in a few raspberries only adds a few extra calories, but can add a nice flavor to your spritzer. It's pretty easy to lighten up a Cosmopolitan. Traditional Cosmopolitans are made with vodka, triple sec, lime juice and cranberry juice. A four ounce cosmopolitan made in this manner has 213 calories. Replacing the cranberry juice with a zero calorie cranberry flavored beverage and the lime juice with a twist of lime lowers the calorie count significantly. As you can see, it is possible to occasionally fit low calorie alcoholic beverages into your low calorie diet. Moderate, occasional alcohol intake needn't throw you off track.